Haunted Bodies is a collection of drawings and writings created while moving through and beyond a year of depression. At their core, they are about the essentials of what it is to be a human who hurts, one who wrestles in the dark and stares down pain in a fierce struggle to mend. The poems were written concurrent with my daily wrestling; they were an attempt to name my experience and find a landing pad amid the fog. The dated entries are directly pulled from my personal journal, and included as an unedited approach to sharing my constantly pained headspace. The drawings were created while coming out of the miasma and were my approach to capture the “haunted” feeling of inaccessibility. 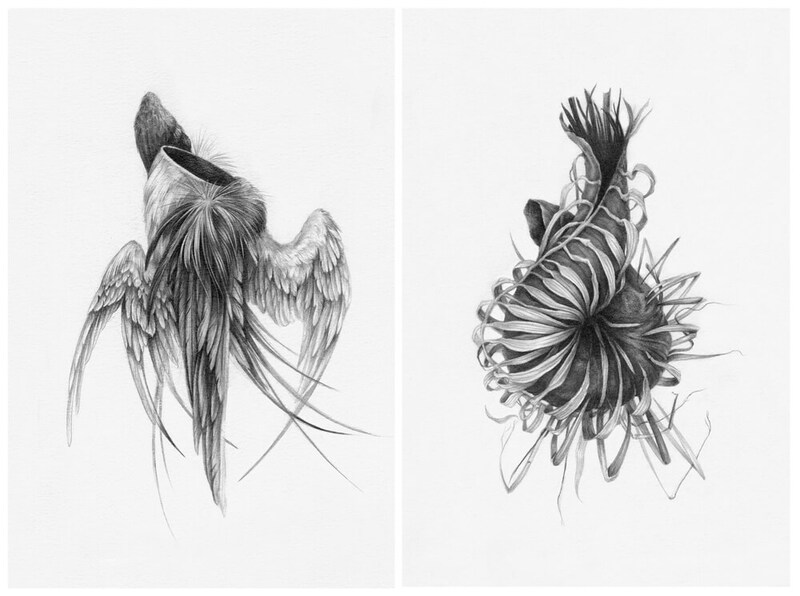 Merging pieces of organ, flora, and animal, these faceless drawings focus on the body and were an exercise in reclaiming my own. Releasing this collection as a book creates a physical reminder both of the reality of a difficult circumstance and the community moving through the common casualty of life alongside me. It creates the space that only books can, where one may participate whilst in the solitude of their experience, yet close and put back up on the shelf. Haunted Bodies was recently funded on Kickstarter, if you’d like a copy they are available in my online store.